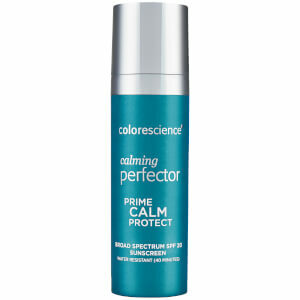 Correct and protect your skin with the Colorescience All Calm Clinical Redness Corrector SPF50, a 3-in-1 proprietary formula that helps to neutralize redness while soothing and protecting sensitive skin. The moisturizing color corrector has a subtle green undertone to help counteract redness, and is fortified with a non-chemical, mineral SPF for broad spectrum UVA/UVB protection. Calming and relieving signs of redness and sensitivity, the clinically-tested formula contains a patent-pending BioSolace™ complex for ongoing relief. A color corrector and sunscreen all in one, it will leave skin looking balanced and feeling comfortable. Free from gluten and parabens. Non-comedogenic. Dispense 1-2 pumps onto your fingertips and rub between your fingers to activate the minerals. Apply liberally to lightly moisturized face ensuring even coverage as the first step in your makeup application. Follow with your favorite Colorescience foundation and enhancers. Apply Sunforgettable SPF 50 Brush-on sunscreen every two hours for complete protection. Active Ingredients: Titanium Dioxide 11.6%; Zinc Oxide 8.6%. Inactive Ingredients: Cyclopentasiloxane, Caprylic/Capric Triglyceride, Water/Aqua/Eau, Dimethicone Crosspolymer, Niacinamide, Disteardimonium Hectorite, Dimethicone/Vinyl Dimethicone Crosspolymer, Propylene Carbonate, Disodium Lauriminodipropionate Tocopheryl Phosphates, Crithmum Maritimum Extract, Magnolia Officinalis Bark Extract, Zingiber Officinale (Ginger) Root Extract, Magnesium Carboxymethyl Beta-Glucan, Jojoba Esters, Bisabolol, Silica, Polyhydroxystearic Acid, Dimethiconol, Alumina, Glyceryl Behenate/Eicosadioate, Phenoxyethanol, Triethoxycaprylylsilane, Ethylhexylglycerin, Tocopherol, Dehydroacetic Acid, Benzoic Acid, Glycolic Acid, Chloroacetic Acid, Chromium Oxide Greens (CI 77288), Iron Oxides (CI 77491, CI 77492, CI 77499).